It was a childhood dream to become a Peace Corps volunteer. "It was a childhood dream to become a Peace Corps volunteer." says Helen. When I was a child, I saw many commercials on TV about this organization. It is very prestigious to be a Peace Corps Volunteer. Why did I come specifically to Ukraine? It has much to do with my degree. I finished "Russian and Eastern European Studies" and was very interested in the region of Russia and the Former Soviet Union, its history and culture. I wanted a personal experience to learn about Ukraine. I do not have any Russian or Ukrainian roots in my genealogy (although I have heard tell of a lady in our family who looked quite northern…). During my childhood, my mother and I often watched an old black and white movie "Anastasia" about the Russian Tsar and the Romanov family. The film fascinated me. To visit this region of the world became a childhood dream for me as well. These two dreams came true in September 1998 when I came to Ukraine. First, I attended a three-month training in Cherkasy and then I went to work at the Mariupol Humanitarian Institute. 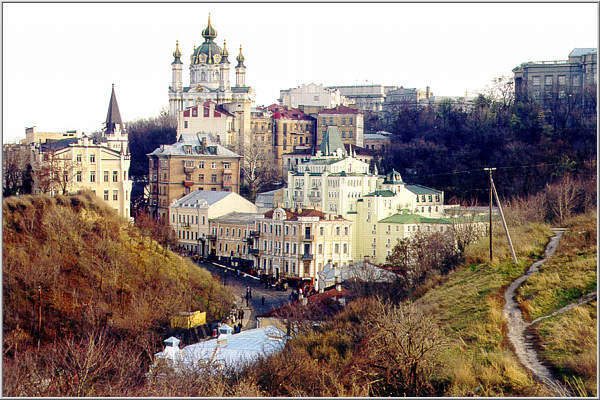 Now I am in Kyiv where I hope to continue my voluntary activities. What kind of expectations did I have about Ukraine and Ukrainians before to come here? I thought I would live in a village and speak Ukrainian. Instead, I live in a city and speak Russian. About Ukrainians? I expected to find people who were weakened by history. But I met very strong people, who had built up a society, families, and friendships. I am really amazed by how much has changed for the better within these past two years of my stay in this country. It is really progressing. And I am very happy that I can not only observe this process, but also participate in it". Hello, i am very much interested to become a peace corps i do like the way they go out and take care of other.I have always dream of becoming one but then my dreams are still suspending. I very much enjoy it. Please what can i do? I am a Cameroonian and 22 years old and leaves in Cameroon.